presented by Richard Ormand--Sargent's grand nephew, during a special awards ceremony at The Metropolitan Museum of Art in New York City. In 1998 he completed his third book, Alla Prima-Everything I Know About Painting, published by Stove Prairie Press, LLC, which focuses mainly on painting from life. 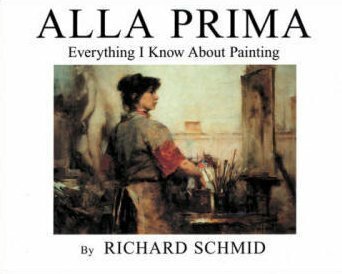 Schmid draws upon his classical training to reveal the knowledge & skills involved in Direct Painting--(also knows as AllA Prima--or one session painting). Fifteen years in preparation, his book offers to the artist & art lover alike the wisdom & savvy of a lifetime of painting. The first three printings of All Prima have been sold to painters in 34 countries throughout the world as well as to artists, museums, libraries & art collectors in the United States. The new fourth printing, (the second printing of the revised edition), is planned for the summer of 2000. In addition, Richard Schmid's paintings & lithographs are represented by West Wind Fine Art 802-366-8126 have been exhibited by: The Smithsonian Institution, The Thomas Gilcrease Museum, The Butler Institute of American Art, The Colorado Historical Society, The Beijing Exhibition Center in China, the Art of Institute of Chicago, The Pennsylvania Academy of Fine Arts, The Connecticut Academy of Fine Arts, The National Academy of Design, The Frye Museum, Allied Artists of America, The Palette & Chisel Academy, The Tucson Museum of Art, The Salmagundi Club, The Southern Vermont Art Center in Manchester, The Bennington Center for the Arts in Bennington, Vermont, among others.